FLORENCE (Italy) – La Marzocco, the Florentine manufacturer of high-end handmade professional coffee machines, will be showcasing its itinerant ORIGIN photographic exhibition at photokina 2016, Cologne – the leading international photography tradeshow – in collaboration with Leica. The exposé will be located at the immediate entrance of Leica’s gallery area at Hall 2.1 within the Koelnmesse venue, where La Marzocco will be hosting the “True Artisan Café” (its signature on-site rotating coffee shop format to promote local and international roasters) in collaboration with German specialty coffee brands Schamong Kaffeerösterei (Tuesday 20th-Thursday 22nd September) and Ernst Kaffeerösterei (Friday 23rd-Sunday 25th September). ORIGIN will be featured in the dedicated collection “Masters of Photography” by Leica and presented by the photographer himself, Jakob de Boer, during his talk “In Pursuit of Alchemy” at Leica’s on-stage program on Thursday 22nd September, from 2-3 pm ((Hall 1). De Boer, a Canadian artist, spent time in the Spring of 2014 at the SONGWA Estates farm, the seat of a non-profit endeavour in which La Marzocco participates. 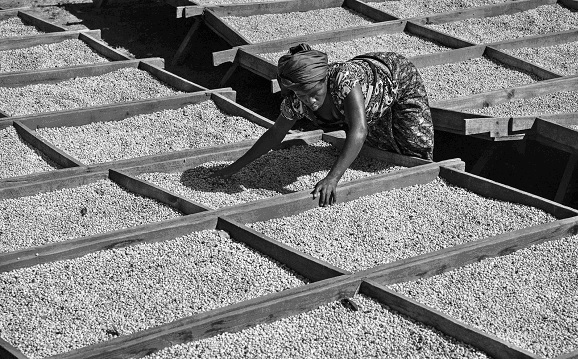 The Florentine company, for several years, has promoted the agricultural activity, education and socio-professional integration of the small African community, whose livelihoods depend on the cultivation of coffee. Coffee is the most commonly traded resource in the world, following oil, and it represents a primary source of income for those populations who reside along the equatorial belt. Through JAKOB DE BOER’s artistic photos, captured meticulously by the Leica M Monochrom, the daily lives of the small community are revealed, where women are the protagonists in cultivation and harvest. Influenced by artists such as Caravaggio and Vermeer, the photographer’s images narrate stories, invoke emotions and capture details that reveal the singularity and beauty of the setting, emphasising the close relationship between man and nature. Each of the 16 photos on display have been printed manually rather than digitally by a prestigious Parisian studio. Black and white, exalted by silver tones, renders the African landscape and local personas especially evocative. Large photos, comparable to paintings from the Dutch school, where nature is celebrated by the play of light skillfully captured by the eye of the photographer, the eye not only being witness to, but a companion on a journey into the activities of the SONGWA farm. A percentage of the proceeds for the sale of the photos will be donated to benefit the community in the immediate vicinity of the plantation.